Although the American government had known that war with Japan was essentially inevitable, no one expected the Japanese to be a serious threat, especially since General Douglas MacArthur, commander of American forces in the Philippines and self-appointed expert on Asia, had predicted that the Japanese would not attack before April 1942. The Filipino and American forces were spread out on a number of islands because MacArthur insisted on defending the entire archipelago, but this strategy proved to be a major error when the Japanese landed the majority of their troops on Luzon island on December 22, 1941. Despite a warning that Pearl Harbor had been attacked, the American planes had been caught on the ground and swiftly destroyed on December 8, leaving the American forces defenceless against the Japanese air force. Recognizing that the main island of Luzon could not be defended, the American and Filipino forces retreated to the Bataan peninsula, planning to hold out until a relief expedition could arrive. A scratch platoon of soldiers from different units is ordered to blow up a key bridge over a ravine on the Bataan Peninsula and then stop the Japanese as long as possible from rebuilding it in order to give MacArthur time to organize. The patrol is made up of eleven men, as well as a pilot and his mechanic who are trying to repair their plane. Sgt. 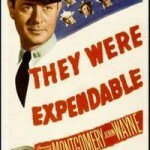 Bill Dane (Robert Taylor) is convinced that one of the men, Cpl. Barney Todd (Lloyd Nolan), is actually an escaped prisoner who was sentenced to hang after killing another soldier in a fight years ago. The captain in charge of the patrol is soon killed by a sniper, leaving Sergeant Dane in command. Dane has to motivate the mix of soldiers, most of whom are recruits, to hold their camp against snipers, dive bombers, and infantry charges, while keeping an eye on Todd, who seems likely to shoot him in the back to avoid being arrested and hung. One by one, the members of the patrol die until it seems impossible that the survivors will be able to escape. The script provides a brief explanation of the situation. The American and Filipino forces are retreating towards Bataan, pursued closely by the Japanese. The first few scenes illustrate the stark situation. An endless column of refugees move along the road but are attacked by Japanese dive bombers, who even drop bombs on ambulances marked clearly with a red cross. While the real MacArthur’s original plan to stop the Japanese at the beaches had been ill-conceived, once he finally recognized that the Filipino and American forces were too weak to hold off the Japanese, he worked hard to organize an orderly retreat. The retreat to Bataan surprised the Japanese since they had expected that MacArthur would defend Manila, but the task of uniting the troops of the North Luzon and South Luzon forces at the same time as they fell back was almost impossible. The rearguards had to wait until the last possible instant before blowing up bridges to enable as many troops, refugees and supplies to make it across. Remarkable coordination between HQ and the two separate forces ensured that they made it safely to Bataan by early January 1942. Since the movie was made during the war, the script ignores the many blunders and the lack of preparation. 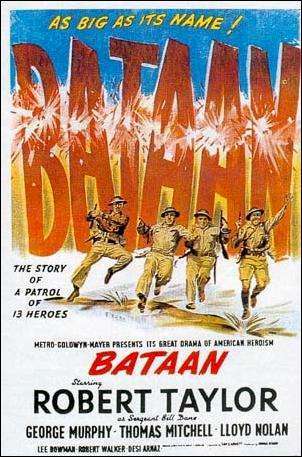 Instead, the opening credits explain that when Japan struck, the U.S. needed time to build defences and that time, 94 precious days, was bought by the defenders of Bataan. 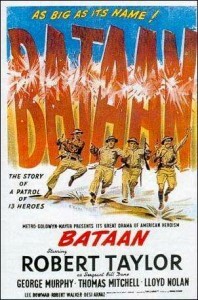 The final narration states that the sacrifice of the heroes of Bataan made possible later victories, including the Coral and Bismarck Sea, and Midway. After the Japanese unexpectedly swept across the Pacific, the United States needed heroes, so the government used MacArthur and the soldiers at Bataan, even though they did not delay the Japanese, who had actually conquered more than they had expected. One of the soldiers ridicules the belief that the forces in Bataan will eventually be rescued by a relief expedition, but the other men refuse to believe him. Unfortunately, he was right. By the spring of 1942, the forces at Bataan were alone in the Pacific. Every possible garrison that could have helped had been overrun. Hong Kong, Singapore, Malaya, Wake Island, and the Dutch East Indies. Only Bataan was left. Although it was not public knowledge at the time, the Pentagon decided that it would be a waste of resources to try to break through the blockade and reinforce MacArthur. The movie is definitely propaganda. The patrol includes a Filipino scout, an Hispanic-American (played by Desi Arnaz) and Private Wesley Epps (Kenneth Lee Spencer) a black engineer and demolition expert who works well with his white partner. The American military was still segregated at the time, but no one objects to serving with a black man. MGM is to be praised for producing a racially integrated film, since theatre chains in the southern states refused to show any films that opposed segregation, although the award from the NAACP must have been some consolation. 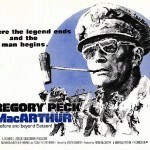 Fearing that Robert Hardy Andrews, the screenwriter, would produce a speech about racial equality if he knew that one of the soldiers was black, executive producer Dore Schary did not tell Andrews because he wanted Epps to treated equally without any special attention. The approach works well and helps separate the film from the majority of cookie-cutter propaganda films produced during the war. However, this racial tolerance does not extend to the Japanese, who are repeatedly called monkeys by Sergeant Dane. Lloyd Nolan’s Todd radiates sullen disrespect, and mocks the idea that a relief expedition is coming. Refusing to admit that he knows Dane, he refuses to break character, which results in an entertaining contest between the two men, as Dane repeatedly tries to trick him into admitting his real identity. However, he is the best soldier in the unit, and displays a gruff tenderness at the end. 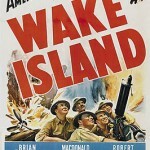 Robert Walker stands out as a relentlessly optimistic sailor, and there is a touching scene where the grizzled veterans Todd and Dane help him write a letter home. Since it is propaganda, the Japanese are clumsy and slow, unable to beat an American in a fair fight and treacherous but brave. During the only real battle, five members of the patrol kill dozens of Japanese soldiers. The script follows the basic plot of The Lost Patrol where an isolated group of men deal with personality clashes while fighting an unseen enemy. As the number of graves grows it seems increasingly likely that they will not survive, and the film ends with the last survivor standing alone next to a line of graves, having dug his own grave. A workmanlike film, it is not an original story but the cast is made up of an excellent group of character actors and the story moves along quickly.